As you may have noticed I've been on the road a lot in 2013 with multiple work trips, and a few vacations for good measure. 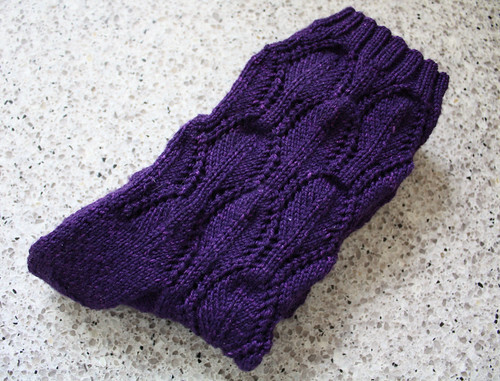 Since learning to knit back in February, knitting socks is quickly becoming my favorite portable project. Here are a few pictures of my second ever pair of socks (yah I'm just a tad proud of these). On my last trip to Toronto I picked up a skein of Serenity 20 in moon purple by Zen Yard Garden from Lettuce Knit. This blend of 70% superwash merino, 20% cahmere, and 10% nylon has me hooked. It's so soft and silky to knit with, and of course to wear - I need to buy more ASAP! 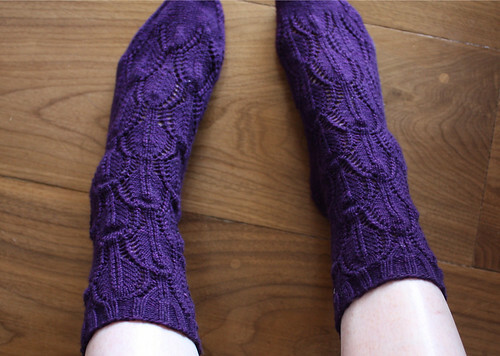 I followed a free pattern that I found on Ravelry called Medallion Lace Socks, posted by Andrea Fox. Her instructions were excellent and I especially liked her heel and toe detailing. Such small elements can really make or break a project like this. I'll definitely be knitting this one up again in the future. Is it just me or are socks really awkward to photograph? I'll leave you with a true-to-colour photo so you can drool over its prettiness the way I do. This colour is called moon purple and I would buy it in bulk if I could. After this pair of socks, I'm definitely a sucker for a good semi-solid yarn now! Very nice! 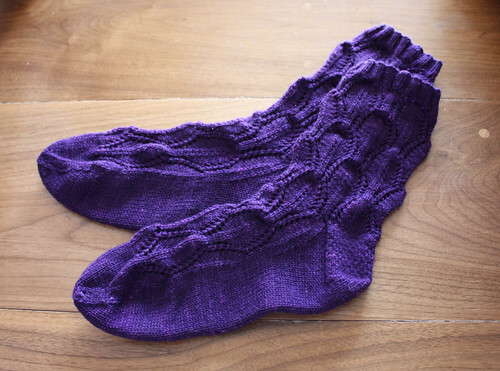 I used to knit socks too, once upon a time. Yours are lovely.